Onlookers surround the Curtiss C-2 in which 21-year-old Lawrence Sperry demonstrated his Sperry gyroscopic stabilizer to win the Concours de la Securité en Aéroplane on June 18, 1914. The maverick inventor who created the autopilot had 23 patents to his name related to aircraft safety when he ran out of luck over the English Channel. The two grandstands between Pont Bezons and Pont Argenteuil were packed with spectators, on hand to see the Concours de la Securité en Aéroplane (Airplane Safety Competition) being held on the banks of the Seine River. On that glorious sunny June 18, 1914, there were 57 specially equipped planes competing, with Lawrence Sperry listed last on the program. Entries featured such improvements in aircraft technology as magnetos, self-starters, carburetors and other innovations. Sperry’s entry was the sole participant equipped with a gyroscopic stabilizer apparatus, designed to improve stability and control. Sperry’s device was mounted on a single-engine Curtiss C-2 biplane with a hydroplane fuselage. 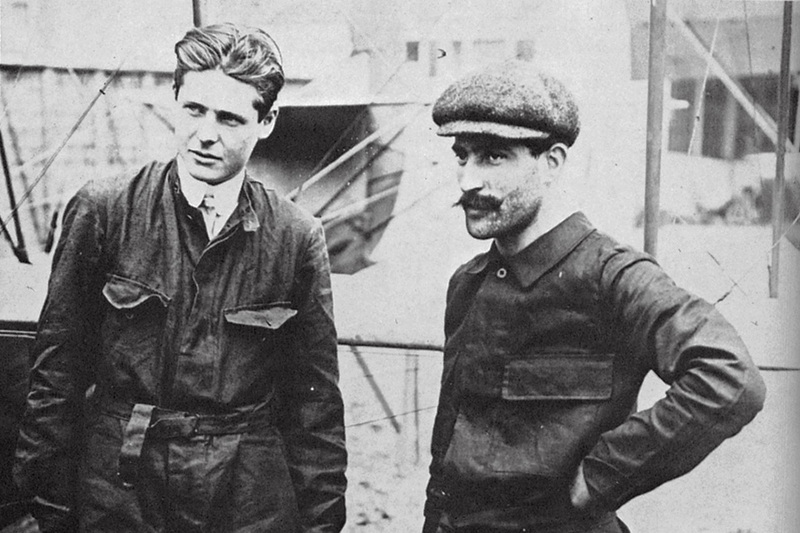 Flying with Sperry was his newly hired French mechanic and assistant, Emil Cachin. Considering that Sperry spoke almost no French and Cachin was equally ignorant of English, they seemed an unlikely team — but they had hit it off with each other from the start. Sperry and Cachin had managed to become sufficiently conversant with each other’s language to bandy about phrases such as stabilisateur gyroscopique and generator electrique with true Gallic flair. Now their opportunity to demonstrate the feasibility of the Sperry gyroscopic stabilizer was at hand. Lawrence’s father, Elmer A. Sperry, a renowned American inventor, accompanied by his wife, Zula, was on hand to see the results, along with the members of the Ligue Nationale Aérienne de France. With the rest of the hushed crowd, they waited to see if what was generally thought to be an impractical gadget might actually work in an airplane. The elder Sperry had earned a worldwide reputation for his development of the gyrocompass, which had been installed on more than 30 American warships. A massive device that was practical only for marine use at that time, his invention was still gaining in popularity and becoming standard equipment on vessels then entering service. The gyrocompass was immune from deviation and variation problems, which hitherto had been difficult to overcome, particularly in large steel warships. The massive compensating devices required by conventional magnetic compasses were eliminated by Sperry’s breakthrough. Since then his son, Lawrence, had developed a lightweight adaptation of the gyroscope that could be coupled to control surfaces to maintain the flight axes of aircraft. The firemen’s band of the villages of Bezons and Argenteuil, spotting the aircraft of ‘l’Americain‘ approaching, bravely struck up ‘The Star Spangled Banner.’ The Curtiss C-2 flew down the river, and directly in front of the judge’s stand Sperry engaged his stabilizer device, disentangled himself from the shoulder yoke that controlled the C-2’s ailerons and passed in review with both his arms held high. The aircraft continued on a straight and steady course, with the pilot obviously not handling the controls. The crowd was on its feet, cheering, and shouting: ‘Remarquable!’ ‘Extraordinaire!’ and ‘Formidable!’ Sperry had stunned the skeptics with his ‘no hands’ flying. Sperry elected to make one more pass — his tour de force. As they passed the reviewing stand, there was Cachin on one wing and Sperry on the other, with the pilot’s seat empty. This was a demonstration beyond the already exuberant audience’s expectations. There was the aircraft, flying serenely along with both its pilot and mechanic out on the wings, airily waving to the spectators. The judge, René Quinton, was almost speechless. His comment mirrored the feelings of the crowd: ‘Mais, c’est inoui!’ (‘But that’s unheard of!’). The military observers on hand were simply stunned by Sperry’s performance. And when Commandant Joseph Barrès of the French army air corps prevailed upon Lawrence Sperry for a ride, he not only saw a demonstration of the aircraft’s stability during straight and level flight but also witnessed Sperry’s device performing an unassisted takeoff and landing. Awarded first prize in the competition, Sperry received 50,000 francs ($10,000) and became famous overnight. The handsome young American’s face adorned the front pages of newspapers in Paris, London and Berlin. The New York Times was more muted in its reception, however. A report covering the competition appeared on page 6. In the Times of June 22, Sperry’s invention was mentioned on the editorial page in these deprecatory terms: ‘Of stability commonly understood, no heavier than air flight vehicles will ever have even as much as that dreadfully fragile monster, the dirigible.’ So much for the technical expertise of The New York Times staff in the summer of 1914. Lawrence B. Sperry was born in Chicago on December 22, 1892, Elmer and Zula’s third son. That same year the Sperry name was well represented at the Chicago Columbian Exposition. At the time, Elmer was the chief executive officer of the Elmer A. Sperry Company, with more than 70 patents either granted or pending. Among his developments were the Sperry Electric Street Car as well as the first arc lights (developed when he was only 19), which graced both the Chicago Board of Trade and Tribune buildings. As an inventor, Elmer Sperry was generally regarded as being almost on a level with Thomas Edison.The Sperry clan relocated to Brooklyn, N.Y., and bought a house in the solid middle-class neighborhood of Flatbush. Lawrence was an energetic youth, and by age 10 he had acquired a bicycle and a newspaper route. The events at Kitty Hawk, N.C., that made the front pages in December 1903 left a strong impression on him. The ingenuity of the Wright brothers spurred young Lawrence to open a bicycle, roller skate and doorbell repair shop in the basement of the family house. It was an instant success, and in short order he expanded his operations to include motorcycle repair. From an early age, he displayed a natural yen for mechanical devices, despite a lack of formal training. The Sperrys usually traveled to Bellport, Long Island, each year for a summer of seaside tranquility. This absence by the rest of the family was the opportunity for Lawrence and his brother, Elmer Jr., to make their big move in 1909. Lawrence had studied a Voisin biplane that he had seen at an airshow at Mineola, on Long Island, and had made meticulous notes on its dimensions and construction. Now, with the town house empty except for servants, the Sperry brothers started building a glider in the basement. First the boys built the steam box they needed to bend wood to the required shapes. They also set up a jig on the floor, where the pliant wood could be clamped until dry. The furnace in the basement furnished steam for the production of the aircraft components. The boys’ glider plans went out the window when an interested customer, a Mr. Wilcox, asked Lawrence what he planned to use as an engine. An engine? That sounded intriguing. A 5-cylinder Anzani radial engine was available at a cost of $800. The Anzani could claim demonstrated reliability. It had been the power plant of the aircraft in which Louis Blériot in 1909 became the first man to fly the English Channel. The Sperry brothers had only $300 in their till, but Wilcox was willing to put up the balance so their plane could have an engine. Repayment was to come from the proceeds of a soon-to-come barnstorming career by 16-year-old Lawrence — who had not yet even made it into the air. If nothing else, Lawrence was daring. When the plane’s wings turned out to be too large to fit through the doors of his parents’ house, he proceeded to remove two large, handsome bay windows from the house so they could carry the semi-assembled aircraft out into the yard. Sperry Sr., upon discovering the alterations, made a reasonable decision — that the first earnings from young Lawrence’s new flying career would be allocated to pay for repairs to the house. With the engine not yet on hand, Lawrence thought it might be prudent to begin flying his plane as a glider so that he could get some practice. After talking his way into using the nearby Sheepshead Bay Race Track, which had fallen on hard times, Lawrence towed the aircraft to the new proving ground with a Panhard automobile he had acquired. After assembly, the glider was hitched to the Panhard, and with Elmer Jr. at the wheel, the maiden flight began. The plane had reached a height of 150 feet when the tow rope broke. The glider, with Lawrence at the controls, proved fairly tractable in the air, although he did have a hard landing and received a few scrapes and bruises. The glider needed only minimal repairs. After that initial hop, Lawrence was consumed by the flying bug. The Sperry brothers’ shiny new engine arrived the following week and was installed without delay. As a protective measure, Lawrence had taken steps to prevent a noseover by installing six bicycle wheels as an enhanced landing gear. Fueled up, the engine started, and then, sensing the moment of truth was at hand, Lawrence opened the throttle. With his recent experience in the glider coupled with apparently latent talent for flying, Lawrence reached the respectable altitude of 500 feet. Even more important, he made a decent landing. Realizing that a mostly on-the-job education in flying was insufficient, Lawrence decided to formalize his conquest of the air. After a few more years of academic study, he enrolled in the aviation school run by Glenn Curtiss at Hammondsport, N.Y. Sperry learned quickly. On October 15, 1913, he received Federal Aeronautics Pilot License No. 11 from the Aero Club of America. At this time Curtiss was working under the auspices of the U.S. Navy to develop a hydroplane. In the same shop, Sperry, the youngest licensed pilot in the United States, was soon developing a new interest, a gyroscopic stabilizer for aircraft. Sperry’s goal was to develop an apparatus that would enable an airplane to maintain its course and attitude under all circumstances. Sperry had been intrigued by the tendency of a motorcycle or bicycle to remain upright provided it was moving. The Wright brothers, with their experience in bicycles, had also dabbled in the gyroscopic phenomenon but had not explored it very deeply. The principles of the gyroscopic effect were fairly well understood at that time, but as yet there had been no attempt to utilize the gyroscope’s capabilities in an aircraft. Sperry hit upon the idea that if the three flight axes of an aircraft — yaw, pitch and roll — could be harnessed to the stability of a gyroscope, an automatic control system might be developed. Yaw represented lateral deviation from the course heading, pitch was the up and down divergence from level flight, and roll referred to lengthwise rotation around the axis of flight. The aircraft might wander through the flight axes without pilot input on the controls, but Sperry reasoned that a spinning gyroscope could maintain an airplane’s original orientation. The youthful inventor put it all together by linking the control surfaces with three gyroscopes, allowing flight corrections to be introduced based on the angle of deviation between the flight direction and the original gyroscopic settings. The guidance device would perform mechanically what the pilot performed instinctively. Sperry’s control gyroscopes were designed to maintain a zero setting for all control surfaces unless corrective action was required. The transmission of corrective commands to the controls required a mechanical linkage to the control surfaces. The gyroscopes needed electrical power to maintain rotational rotor speed as the actuating medium. Sperry obtained power for the gyroscope motors by mounting a wind-driven generator on the upper wing, in the slipstream. He had an additional problem, however. His stabilizer was mechanically linked to the aircraft control mechanism, but the aircraft industry was fragmented, and different manufacturers had different methods of operating control surfaces. Sperry’s stabilizer required four gyroscopes rotating at 7,000 rpm. As one of the gyroscopes moved in opposition to the movement of the aircraft, linkage to valves would actuate pistons operated by compressed air and connected by levers to the control surfaces. In addition, an anemometer that could sense inadequate airspeed and incipient stall was also linked to the device and would institute corrective action. The entire device, weighing in at 40 pounds, was compressed into 18 inches by 18 inches by 12 inches — a small package for such a sophisticated and complex apparatus. Sperry had come up with a brilliant solution to the problem of a practical autopilot. But as always, nature sides with the hidden flaw. Since aircraft employed unique control systems, pilots had to learn a completely different cockpit layout for each different type. For example, in Curtiss planes the ailerons were attached to a yoke that fit over the shoulders of the pilot and were actuated by his moving his upper body to the left or right. Another system in many aircraft of that day had the ailerons linked to the armrests of the pilot’s seat. In both the Curtiss and armrest systems, it was difficult to achieve the mechanical force necessary for rapid maneuvers. Some planes used rudder pedals or a rudder bar; others used an automobile steering wheel to actuate the rudder. Some aircraft had multiple control sticks, and a few employed even more bizarre methods. It was clearly impractical for Sperry to design a stabilizer for the unique control actuation methods employed in different aircraft. The breakthrough for Sperry came through by dint of common sense. The diversity of control apparatus was finally stabilized thanks to the universal but reluctant adoption of the Deperdussin system, which has remained in use to this day. The Societé de Production Armand Deperdussin was a financially shaky French aircraft producer operating under the acronym of SPAD, later to achieve fame under a different designation — Societé Pour l’Aviation et ses Dérivés. Deperdussin had developed the modern method of using a central control stick to manipulate the elevators and ailerons, with pedals or a rudder bar controlling the vertical rudder. Ailerons linked to a wheel have remained in use for large, multi-engine aircraft, though few fighters other than the Lockheed P-38 Lightning retained that system by World War II. The simplicity of Deperdussin’s control layout made it immediately popular — and ideally suited for use with Sperry’s device. The U.S. Navy, which underwrote Sperry’s research, had designated Lieutenant Patrick Bellinger to assist him and act as a watchdog during testing. Trials of the gyroscopic stabilizer soon shifted to San Diego, Calif., to avoid the inclement weather near Lake Keuka at Hammondsport, where the Curtiss facility was located. Although the California climate was more benign, Bellinger’s confidence in Sperry’s device had not increased. In flight tests with Sperry, Bellinger had a tendency to grab the controls if the gyroscopic operation seemed slow or reluctant. During one test, Bellinger conquered his tendency to go for the controls, but this time he waited too long, and the Curtiss C-2 they were using as a test-bed flew full tilt into the waters of Spanish Bight. Inexplicably, this mishap converted Bellinger into a Sperry adherent. Sperry managed to rescue the stabilizer, and both men suffered only a dunking.In subsequent trials, Sperry finally solved most of the problems. Rudder position had to be offset to overcome engine torque. Aileron settings had to compensate for the location of the center of gravity in each aircraft. As the work progressed, Sperry finally reached the ultimate test. With Bellinger sitting nervously in the cockpit, Sperry clambered out onto the wing. The device worked as designed and corrected the banking momentarily caused by the transfer of Sperry’s weight to the wing, confirming Bellinger’s newfound confidence. The Aero Club of France and the French War Department announced an international airplane safety competition, the Concours de la Securité en Aéroplane, scheduled for June 1914. Curtiss knew a good public relations gambit when he saw it and offered to send one of his C-2s, with Sperry to provide his stabilizer and flying expertise. The competition was a smashing victory for Sperry. With the outbreak of World War I weeks later, Sperry’s life changed. He offered to serve in a French frontline squadron as an experienced pilot, but to his dismay officials turned him down because he lacked a college degree. Undaunted, he returned to the United States to continue his research. So far, Sperry had flown hydroplanes almost exclusively, but he began to think about creating a dual-purpose aircraft. He reasoned that a flying boat could carry a retractable landing gear so that it could also operate from a land base. The result: The Aerial Age Weekly issue of March 29, 1915, featured an article with Sperry demonstrating what was the first wheeled retractable landing gear in an amphibian. Lawrence traveled to Britain and returned in 1916 with a briefcase crammed full of orders for what is now famous as the automatic pilot. At age 24, he had become a well-known inventor. In 1916 he was also commissioned a lieutenant junior grade by the U.S. Navy and assigned as a flight instructor. Lawrence Sperry never rested on his laurels. Between 1915 and 1923, he had 23 patents either pending or granted. Among his inventions was instrumentation that permitted aircraft to be piloted when visibility was zero. His bank-and-turn indicator and artificial horizon have remained the basic instruments for every aircraft from the Boeing 747 to the Piper Cub. He also came up with a variety of other instrumentation, including an airspeed indicator, a drift indicator and a significant improvement over the (British) Creaghton-Osborne liquid-filled magnetic compass. After the United States entered World War I on April 6, 1917, Sperry continued research on an aerial torpedo that was actually a guided bomb. Working in concert with automotive inventor Charles Kettering, he produced a prototype of a pilotless aircraft rigged to fly a preset course to a designated target. Another member of that research team was 1st Lt. James Doolittle of the U.S. Army, whose name would become a household word in the three decades to come. The project, called the ‘Bug,’ was not entirely successful, largely due to the unreliability of the engines used. The Sperry-Kettering research, however, provided the guidance principles utilized in Germany’s later development of a flying bomb, the Vergeltungswaffe-1 (V-1 vengeance weapon), in 1944. The Germans solved the problem of unreliable power plants by using a simple and reliable pulse-jet engine, which required an absolute minimum of moving parts. While testing the Bug in March 1918, Sperry — who was serving as pilot — crashed, suffering a broken pelvis that immobilized him for three months. During his recovery he spent time on calculations that would result in a new and improved parachute. By the time he was released from the hospital, he knew he had invented a seemingly foolproof seat, or backpack, parachute. His design would eliminate the problem of a parachute becoming entangled in aircraft empennage. To test his device, he went to the roof of the Garden City Hotel, on Long Island, and let his parachute fill and drag him from the roof. It performed as designed, and he landed safely. The Sperry parachute soon entered production. At WWI’s end the entire nation turned to civilian diversions, and Sperry shifted gears as well. As the result of a conversation with Brig. Gen. Billy Mitchell, assistant chief of the U.S. Air Service, Sperry designed and built an inexpensive sport plane, the Sperry Messenger, which could reach 95 miles per hour. It had a 20-foot wingspan and was powered by a 3-cylinder radial engine that delivered 30 miles to the gallon. Mitchell was so impressed by the design that the Army ordered a dozen for general service. The Messenger was also well received by civilian aviators and appeared at airports around the country. Sperry used a Messenger to commute from his Brooklyn home to the factory on Long Island. He would routinely land and take off from the parade grounds on Parkside Avenue, adjacent to Prospect Park, and leave his aircraft at a convenient police station at the western end of the impromptu landing field. His home on Marlborough Road and the site of his initial aircraft production plant were within easy walking distance. An experienced pilot with more than 4,000 hours of flight time, fully trained to fly by instruments alone, Sperry had no hesitation in taking off in any weather conditions. His personal aircraft was always fully equipped with instrumentation of his design. On December 23, 1923, he took off from Britain for a quick flight to France, undeterred by the fact that the Channel was fogbound. Somewhere en route, however, his luck ran out. Whether due to mechanical failure or inability to navigate over the Channel, he never reached his destination. The Messenger he had personally designed was found in the water. Sperry’s body was recovered on January 11, 1924. The Sperry aircraft manufacturing effort did not survive the loss of Lawrence Sperry. Without his vision and ingenuity, the company could not cope with the increasing competition of inexpensive surplus World War I aircraft then being sold in enormous numbers by the government. But the name Sperry lives on today — a revered imprimatur among many aircraft factories that remains part of the nomenclature of aircraft instruments to this day. The autopilot and stabilization system was also adapted for marine use. All major passenger ships plying oceans today employ a Sperry-type stabilizer actuating a winglike device to dampen rolling. A form of the Sperry autopilot linked to a Sperry gyrocompass is in common use today on every ship of any size. The illustrious family name is also maintained today on the nameplates of diverse navigational equipment produced by the Sperry Marine Corporation, a division of Litton Industries Incorporated, as well as the Newport News Shipbuilding Corporation of Virginia. Given Lawrence Sperry’s extraordinary productivity and fertile imagination, it seems especially tragic that he died so young. When he went down in the Channel at age 31, he had 23 patents related to aircraft safety in his name. Surely, had he lived longer, he would have come up with even more brilliant ideas and inventions to make flying easier, safer and more readily available to the public. This article was written by retired Lieutenant Colonel William Scheck, who died in 2003, and was originally published in the November 2004 issue of Aviation History magazine. For more great articles subscribe to Aviation History magazine today!